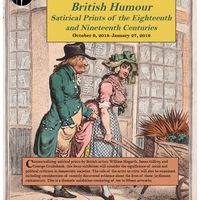 Contextualizing satirical prints by British artists William Hogarth, James Gillray, and George Cruikshank, this focus exhibition will consider the significance of social and political criticism in democratic societies. The role of the artist as critic will also be examined, including consideration of recently discovered evidence about the lives of these (in)famous caricaturists. This is a thematic exhibition consisting of ten to fifteen artworks. At the corner of North Garth and Business Loop 70 West.